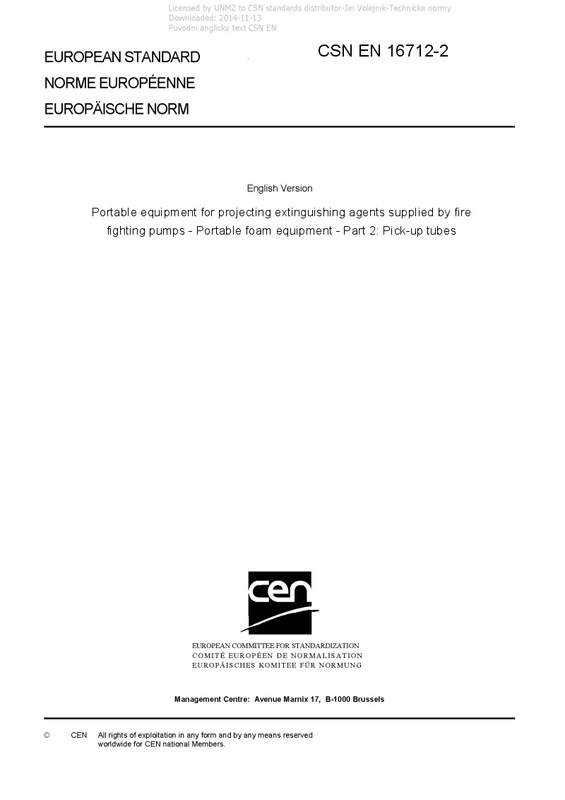 EN 16712-2 Portable equipment for projecting extinguishing agents supplied by fire fighting pumps - Portable foam equipment - Part 2: Pick-up tubes - 1.1 This European Standard specifies performance requirements and test methods for pick-up tubes. This European Standard applies to pick-up tubes from DN 20 to DN 50 which are used for the suction of foam concentrate or additives and defines their requirements and test procedures. Pick-up tubes are especially used with inductors in accordance with prEN 16712-1. NOTE Pick-up tubes can also be used for the suction of other substances (e.g. absorbents). 1.2 This European Standard is not applicable to pick-up tubes which have been manufactured before its date of publication as European Standard.